Gold is brave. Gold is rich. Gold is loveliness. 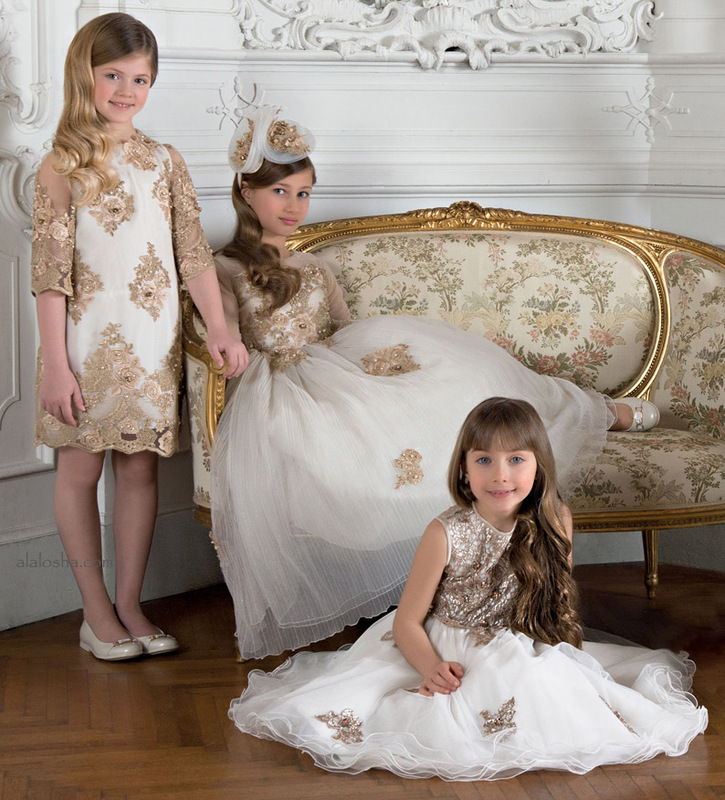 Well for all the reasons, when it comes to gold dresses by Lesy Luxury, a young girl can't resist wearing it for special events. 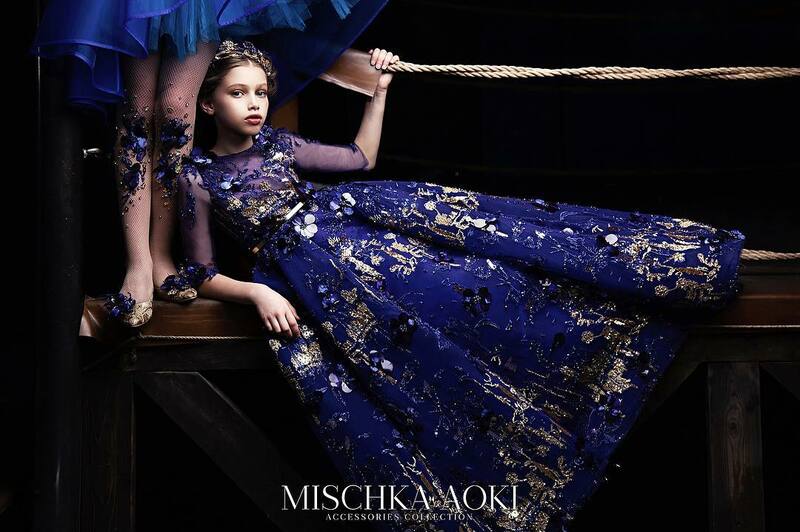 These dresses are so attractive so royal so luxury! They have this magical power to lit up the soiree mood and make it even more glamorous. Girls turquoise blue fur bolero jacket by Lesy Luxury. Made with real fur, this luxurious cropped jacket is decorated with gold floral appliqué with pearls on the chest and has short sleeves that are elasticated. It fastens with a hook and eye and is lined in silky satin. 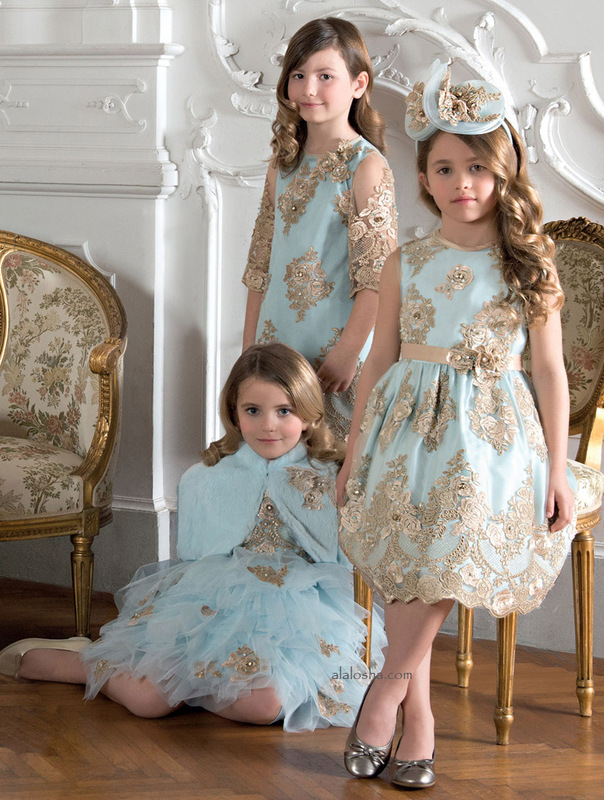 Turquoise blue tulle and gold lace dress by Lesy Luxury. This exquisite design has a fitted bodice with a gold lace overlay, decorated with jewels, beads and pearls. It has a full skirt, made with multiple short layers of fine tulle, with the top layer being embroidered with gold floral appliqué and pearls. There is a satin underskirt and lining, plus a stiff tulle petticoat that creates a full shape. The bodice fastens at the back with a concealed zip. Girls ivory and gold lace bag by Lesy Luxury. This pretty small handbag is made in satin with an overlay of ivory tulle embroidered with an ornate gold floral design, embellished with jewels, beads and sequins. It has a single gold satin handle and a magnetic closure, with a matching lining. Girls gorgeous long length dress by Lesy Luxury. With an elegant look, the beige tone tulle shoulders and sleeves have been left sheer. The ivory bodice has a tulle over-layer, elaborately decorated with gold floral embroidery, sparkling jewels and pearl beads. There are matching embellishments on the skirt and sleeves. The full pleated tulle skirt is ivory and glittery gold, over further white tulle frills and satin layers. With a silky lining it is soft against the skin and it fastens with pearl buttons and a zip at the back. 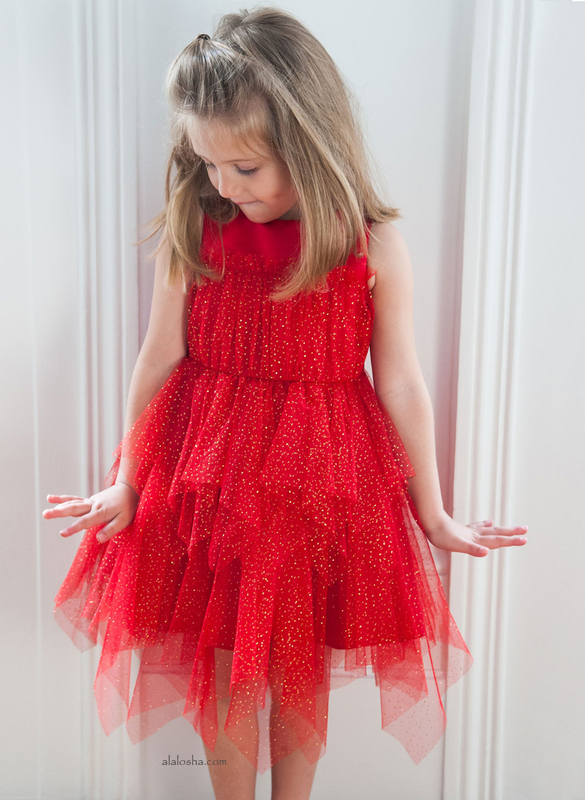 A stunning dress super for special occasions. Ivory tulle and gold sequin dress by Lesy Luxury. This exquisite design has a fitted bodice with a gold sequin overlay, decorated with jewels. The round neckline and arm holes are edged in gold satin. It has a full and flared skirt, with six layers of fine tulle that have fluted hems, with the top layer being embroidered with gold floral appliqué. There is a satin underskirt and lining, plus a stiff tulle petticoat that creates a full shape. The bodice fastens at the back with a concealed zip.